Keats viewed autumn as a season of mists and mellow fruitfulness. For the pest management industry it has been a season of exhibitions and conferences. 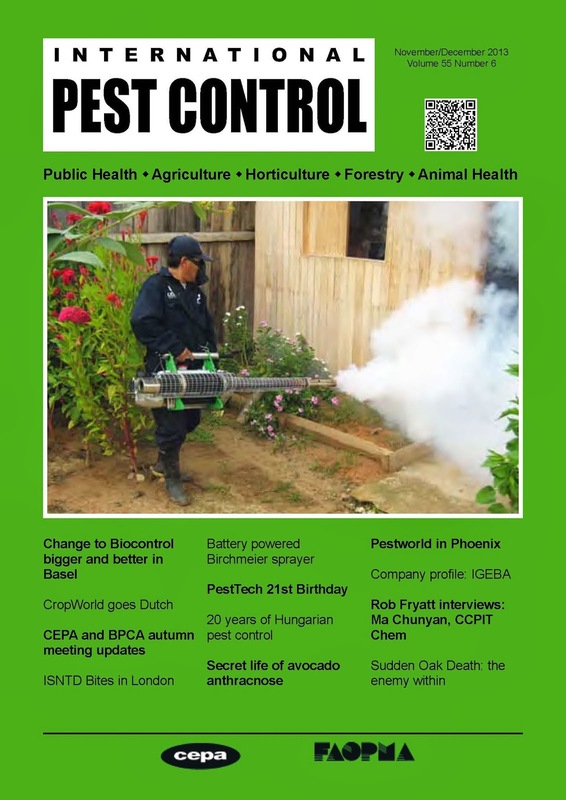 So during this mild autumn, that extended all the way into mid-November, we found ourselves at several key meetings in the US and Europe that are covered in this month’s issue: Pestworld, CropWorld, ISNTD Bites, PestTech and ABIM. Our roving reporting does not finish here and next issue we will cover also the pest control events in Morocco and Korea, taking place in November. and how it is possible to start crops in clean, pest free soil. In advance of the 15th China International Agrochemical & Crop Protection Exhibition(CAC) to be held March, 2014 at the Shanghai New International Expo Center, China, Rob Fryatt interviews Ma Chunyan, Vice Chairman CCPIT Chem, the organisers of the CAC Agrochem Show. Our Technical Consultant, Terry Mabbett provides an insight into the unknown life of avocado anthracnose, revealing how the complexity of disease management in avocado has an extra dimension, as major disease and damage do not show up until after picking, due to the development of latent infections established weeks or months before, while the fruit was on the tree. 2013 has certainly been a full year and as I complete my first 12 months as editor, the publishers, our technical consultants and I have been reviewing what features have gone well, what could be improved and which articles should we feature for 2014. I trust you have enjoyed the magazine and as we constantly look at ways to improve and develop our content, please feel free to contact me with any thoughts and suggestions you may have. And finally, as we head into the holiday season, I would like to wish all our subscribers and other readers a restful end of year and I hope 2014 brings you many future successes. Great Article, Thank you for the post.